Vrijstaande villa met privé zwembad in mooi aangelegde tuinen. Onze moderne villa staat in 1/4 hectare aangelegde tuinen en heeft een ononderbroken panoramisch uitzicht op het platteland. Aan de achterzijde van het pand is een groot grasveld en de tuinen zijn beplant met vele struiken en bomen. De villa is omgeven door heggen die privacy en afzondering. Winkels, restaurants, bars, waaronder gratis Wi-Fi is een mijl afstand in San Clemente. Mahon en de stranden zijn 5 en 15 minuten rijden. De villa is volledig bevoegd voor het laten van de Consell Insular De Menorca. Gratis onbeperkt breedband is beschikbaar in de villa. Binixica is een kleine privé-landgoed ligt op het platteland aan de zuidkant van het eiland. Kinderen jonger dan 2 gratis. Kinderbedje te huren en lakens verkrijgbaar bij villa manager. Welkomstpakket bij aankomst. Bij aankomst ontvangt u een welkomstpakket met etenswaren met essentiële items te vinden. Alle beddengoed en handdoeken (behalve strandlakens). Wekelijkse schoonmaakdienst om beddengoed en handdoeken te veranderen. Parking. Groot gazon. Ononderbroken panoramisch uitzicht op het platteland van de uitgebreide terras. Sony CD / radio / cassette-speler. Nieuwe (2012) Samsung 43 inch plasma satelliettelevisie ontvangen sommige Britse zenders. Dvd-speler. 3 fans. Moderne keuken. Wonderful villa with large pool and plenty of land. Had a wonderful holiday. The villa is fantastic and the kids loved the pool. Would highly recommend this property, it is peaceful even in the height of the season. The only thing that would improve the villa is if aircon was available as it can be very warm in the evenings in August. Such a lovely villa, we had a great holiday here. David was very helpful in arranging our stay and the welcome pack of food and drink was a lovely surprise when we arrived. The villa is well equipped and incredibly clean. The pool and garden area were just perfect and the villa has beautiful views towards Sant Climent. We enjoyed exploring the island and found the location of the villa perfect for this, its not far to the main roads. We had some lovely meals out in the evening in Es Castell and walks around the harbour in Mahon. We have two small children and they thought the villa was just perfect, finding a tortoise in the garden made their holiday! We hope to be come back again soon. We loved this traditional villa with lovely pool. 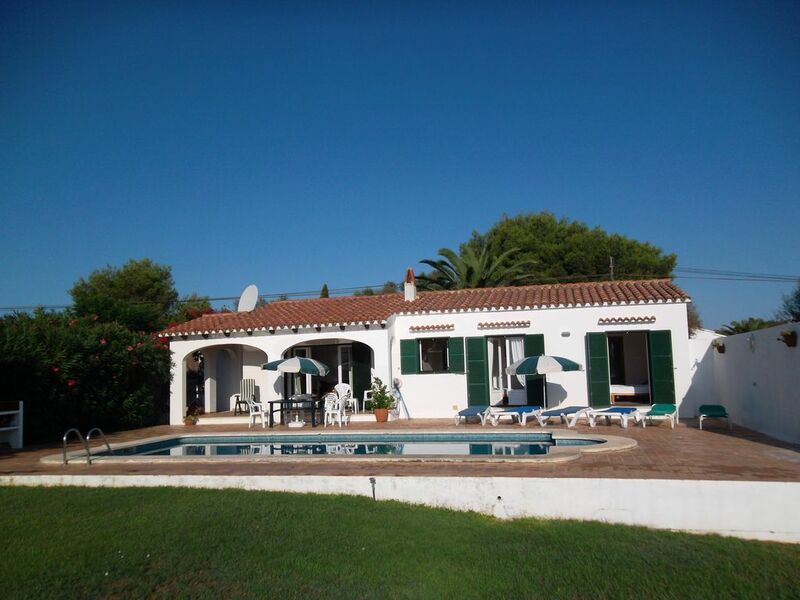 The villa is set back from the quiet residential road with lovely gardens and a sizeable pool. The villa was very clean and maintained to a high standard. The information book was full of useful information. It is worth mentioning here that the buses run, both ways: one way to San Climent (stay on this bus for Mahon where you can pick up buses from the terminus to everywhere on the island) for food and the other way to the beautiful cove at Cala n'porter, from the same bus stop but do ensure you check the timetable as they run about every 1 1/2 hours during the day and have a break of a couple of hours between 2 and 4 for siesta. The buses do stop running relatively early in the evening but there was no problem getting a taxi back to the villa from the main square in Mahon. There is no service on a Sunday. The Spa supermarket is open between 9 and 2 on a Sunday. If you smoke be aware that the Tabac shop in San Climent and is the only place you can buy tabacco products. It closes between 2 and 4 and is open on a Sunday. The walk into San Climent is pretty but it is 2.5k and is hilly in parts with no shade. Do ensure you take water and wear suncream to avoid sunburn. We were caught out in both ways! The villa is homely and traditional and the bedrooms are cosy with really lovely bedding with the additional bonus of having a lovely bathroom each. The beds were really comfy which is important to us. Many of the villas we have stayed in, over the last 7 years or so, have insubstantial beds with poor mattresses so this was a treat. The pool is a really good size for swimming and was very clean with crystal clear water. The welcome pack was really comprehensive and was a lovely treat. I love to cook and the kitchen had every utensil necessary to do this successfully. There was a huge selection of glassware and crockery which was great. We loved the peaceful location and the fact that it is so close to the airport. There is a taxi number in the information folder and the operator spoke very good English so there was no problem ordering a taxi for the return journey. The taxi arrived bang on time too. Dealing with the owner was a pleasure during the booking process; excellent customer service was provided throughout. We found Menorca to be quiet, friendly and sophisticated but if you want nightlife there are nightclubs in Mahon and a Space in Cuitadella. The formula of sun, sand, swimming and sangria should guarantee an attractive repose for anyone seeking escapism, but to do so with this villa as your chosen abode, simply reinforces the experience. My wife and I have returned again and again in the certain knowledge that we will sink into relaxing comfort in this gem of a residence. Although a car (or bicycle, for adrenalin addicts) is necessary for access to Menorca's many exquisite beaches, a lazy day spent relaxing by the pool-side will provide instant relaxation and re-charging of batteries. The villa, gardens, lawn and pool are kept in immaculate condition and the recent addition of another double bedroom with deluxe en suite shower is welcome. The owners obviously take great pride in their villa. The local village, San (Sun?) Climent is only a mile away and provides, inter alia, restaurants, a well-stocked supermarket with, as we have often found, some extraordinary drinks offers (especially their malt whisky), whilst next door is the island's popular Tuesday jazz club. You never know which accomplished player from the audience will give a holiday solo! Mahon, with its luxurious marina, is 15 minutes away by car and offers restaurants galore in what is a strollers' paradise. The only sadness we have is in leaving but we have the consolation of eagerly looking forward to our next return. Hasta la vista: hope to be back soon! We wanted a week of peace and quite, this is definately the villa for it. Welcome pack was very good as you did not need to rush straight out. Villa was very clean and spacious with the pool being cleaned twice and the lawn was cut once. You do need a car as there was no shops within walking distance. Definately recommend this villa for couples who need a break from everything.